When the director of Fort Wayne Trails suggested I make their entry in Fort Wayne’s Chilifest I thought it would be a fun challenge because there were two parameters. First, they wanted it vegan and second, it needed to be hot or “blazin” to help promote the next Fort Wayne Trails event called the Trailblazer 5K/10K on Oct. 21st. 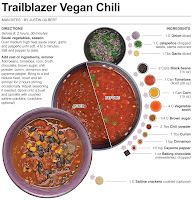 I cringed at the idea of meatless chili, because I’m a complete meat fanatic, but I looked at it as a way for me to cook outside my comfort zone and develop a dish not in my arsenal of recipes. After a number of tests, here are a few details about my creation. 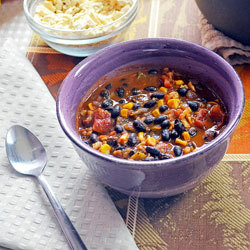 Black beans are used in place of meat, providing heft and they don’t get too mushy after a long simmer. Unsweetened chocolate imparts richness in the absence of fat from protein. Brown sugar and sweet corn are key elements to balancing the bitterness of the chocolate and the heat from jalapenos, cayenne pepper and cinnamon. All this results in Trailblazer Vegan Chili. I met Lori Block Keys, Director of Fort Wayne Trails, at a meeting for entrepreneurs and start up businesses called Vertical Leap at Founders back in August. She was a keynote speaker and talked about the work she had done building bike and running trails all around the city. Lori Block Keys and I at Chilifest. Fort Wayne now has more than 68 miles of trails with much more planned. She has recently started the Countdown to Connectivity drive, an initiative to raise $1 million by the end of 2013. If the goal is reached it will unlock an additional $5 million in funding and be a huge boost for the further development of trail networks around the Summit City. During her talk she mentioned that she taught salsa classes as a hobby of hers. After she spoke and started mingling I asked her if she had ever thought about hosting a "Salsa after Salsa" party for her students. I thought it would be fun to host something like that to help grow my brand locally. She wasn’t sure about the “Salsa after Salsa” party but she did mention a chili competition coming up and that she might need help creating an entry for it. A couple weeks went by, then Lori contacted me about trying to work together on an event. After meeting up, it was decided that I would make their entry at the upcoming Chilifest and I got to work right away. As I mention in the introduction, I was asked to make it vegan and hot. The heat was no problem but the vegan was a first for me. 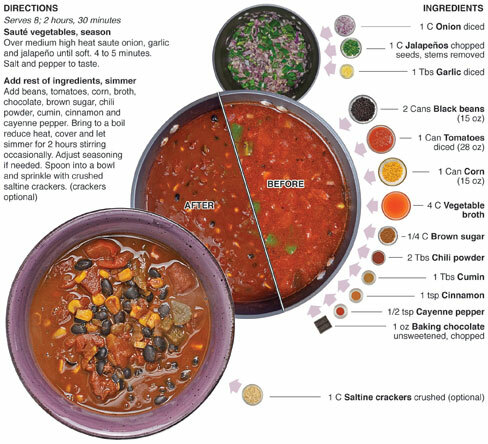 Chili without meat is kind of like a rock band without a drummer. After 5 test runs and many tweaks I had the dish I feature here and I'm really proud of it. I had never done a CASI Sanctioned chili cook off and when I arrived it was apparent that I was a newby to the scene. Other contestants had tents and costumes, trophies and coolers full of booze. I had a giant pot of chili and a flyer with my recipe on it. I felt out of place but by the end of the day being out of place was a good thing. Our booth was the only vegan or vegetarian chili and I was the only cook giving out the recipe. I used it to promote my website and the Trailblazer 5k/10k. It also served as a good press release. I was elated the next morning when the Journal Gazette used my flyer to quote me directly and give me kudos for my tasty chili. 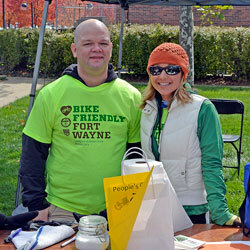 It was a great day overall and I hope to work with Fort Wayne Trails again. Regardless of who I work with though, next year I am most definitely going to enter and and have a tent and decorations ready. It was a fun day for sure. Sauté vegetables, season Over medium high heat saute onion, garlic and jalapeño until soft. 4 to 5 minutes. Salt and pepper to taste. Yay! <3 your blog, and always wished you published more vegan! Best of both worlds!! This is awesome! Made it for dinner tonight for my family and my skeptic 17yr old daughter is raving! Thank you for sharing your great recipe.